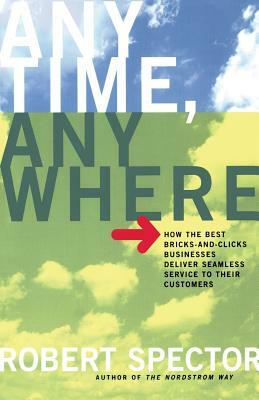 In Anytime, Anywhere, Robert Spector showcases the pioneering efforts of a dozen companies who are now increasing market share by combining the best of both physical and virtual worlds. From Wells Fargo to Powell's Books to the San Francisco Giants, companies in every industry are discovering that "seamless service"-integrating all elements of the customer experience with consistent messages and execution-offers a competitive edge that technology alone can never achieve.Packed with practical advice and colorful, in-depth stories from the front lines, Anytime, Anywhere shows any business how to meet, and exceed, the expectations of customers through all points of contact. Robert Spector is a recognized authority on customer service. A highly sought-after speaker and writer, he is the author of the national best sellers The Nordstrom Way and Amazon.com-Get Big Fast. A frequent contributor to the Wall Street Journal, the New York Times, USA Today, and NASDAQ Magazine, he lives in Seattle. Visit www.robertspector.com.